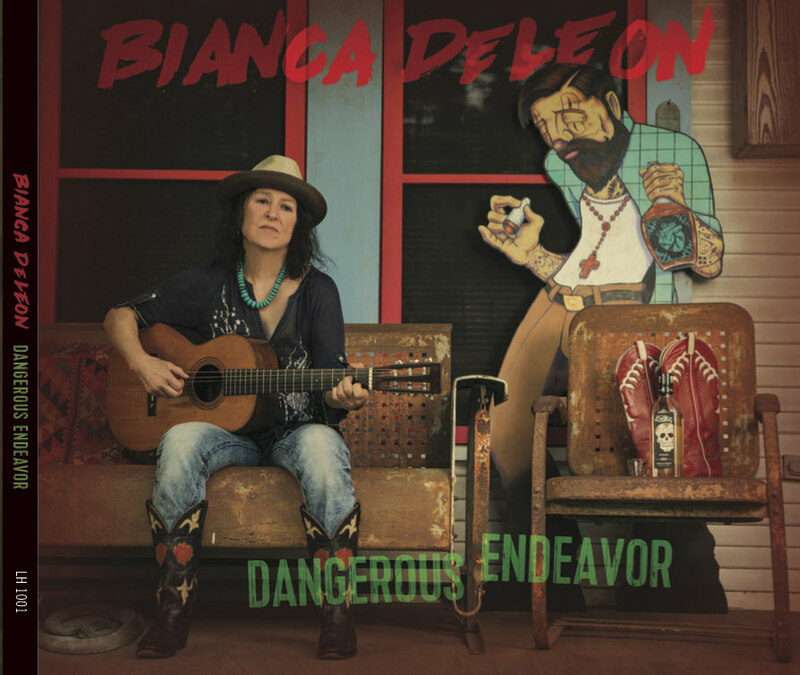 BIANCA DeLEON/Dangerous Endeavor: Praised by Guy Clark, Townes Van Zandt’s sidekick and produced by a Lost Gonzo. Is this real Texas enough for you? Rocking harder than her folkie pals, this gal whose life seems to have inspired several Van Zandt tunes knows how to roll it out on her own in fine style. Now posited firmly as a next gen Austin mainstay, she’s a smoking hot freight train ready to knock you down if you don’t get out of the way. A real sizzler. 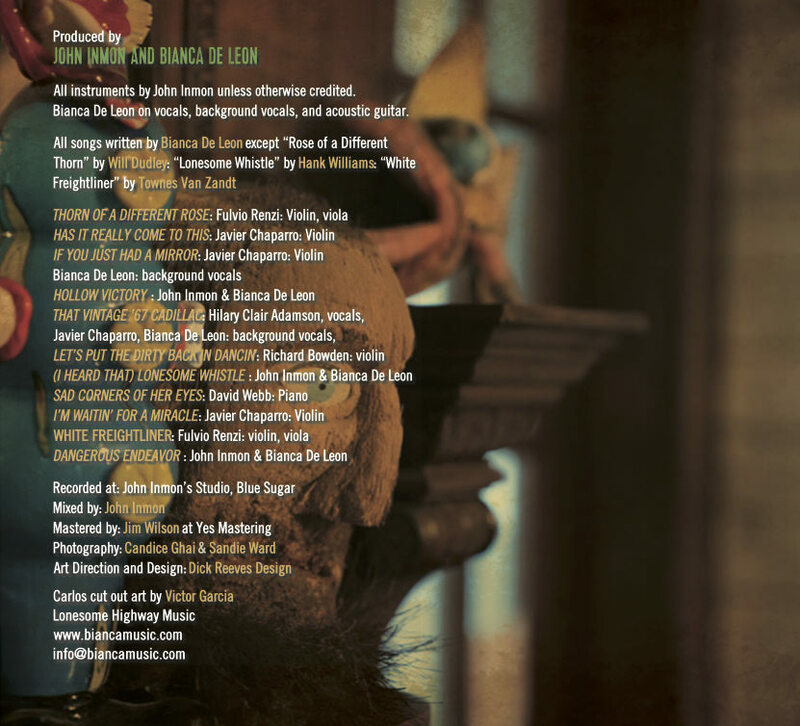 “Queen of the Border Ballad” is a definition that fits perfectly with Bianca De Leon, singer and author based in Austin, Texas whose voice remains one of the most true and genuine of that scene between country and folk. Strong personality, boundless love for the ‘borderline’ sounds that with their romanticism and intensity made us dream with heartfelt and passionate stories, Bianca gave us more than a jewel during a career that has often seen her treading European stages. 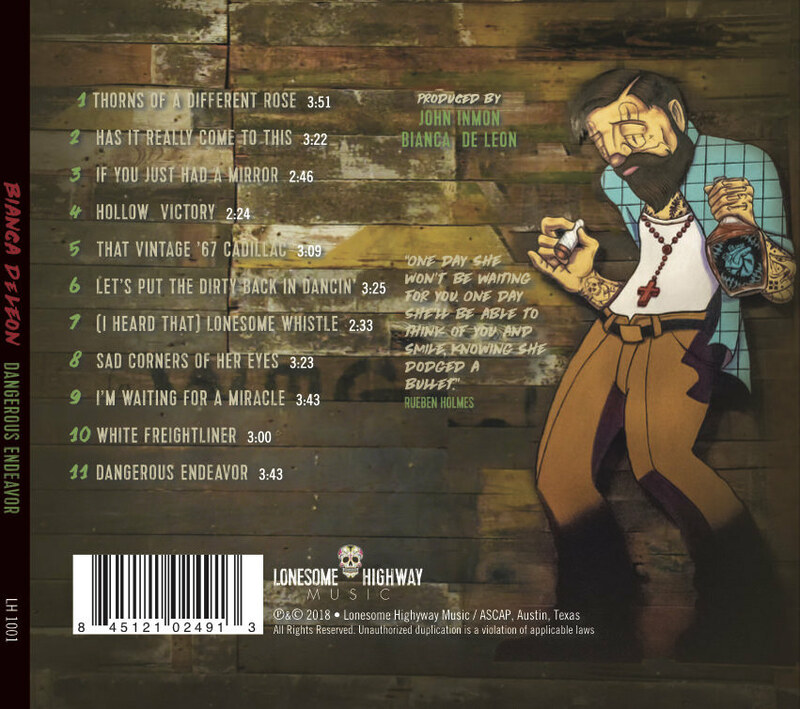 “Dangerous Endeavor” is a further confirmation of the goodness of its proposal, a disc co-produced with John Inmon, one of the most valid animators of the Texas roots scene who contributed to ennoble thanks to his guitar work with the best names of the Lone Star Been in the last forty years and more, which is probably one of his most intense and intriguing works. Bianca De Leon faces two major coverings such as “(I Heard That) Lonesome Whistle” by Hank Williams Sr. and “White Freightliner” by Townes Van Zandt with a light and engaging look, without wanting to overdo it but putting great respect consideration, but it is with the originals that it captures the most. His is a timeless music, interpreted with simplicity but always with that energy that makes it credible and arrangements that only emphasize the beauty of the melodies. So off with the Texas waltz of “Let’s Put The Dirty Back In Dancing”, the almost rockabilly tones of “That Vintage ’67 Cadillac”, terse ballads like “Thorns Of A Different Rose”, “Has It Really Come To This” and “I’m Waiting For A Miracle” and two wonderful songs like the title-track “Dangerous Endeavor” which fully confirms the ‘nickname’ of opening and “Hollow Victory” in which I personally found, palpable, the spirit of the great and unforgettable Townes Van Zandt. Disco full of warmth and passion that I highly recommend. Townes Van Zandt’s “White Freightliner Blues” in a minor key makes perfect sense when performed by Bianca DeLeon, once Townes’ close confidant, now carrying on his tradition of mixing the darkness and the light in her songs of love and loss, innocence and experience, with the emphasis now firmly on experience. A world-weary cover of Hank Williams’ “I Heard That Lonesome Whistle Blow” marks the other boundary of Bianca’s territory, conveying strength and resolution along with the resignation of hard-fought experience. In between, her latest songs continue to weave the threads of the stories her followers have come to love. This is solid songwriting and a voice that gets better with age–and experience. “White Freightliner” just came on, and I m knocked out; I got chills. So great; your voice is amazing, cuts to the bone. I wanna tell you: wow. This cd runs from the darkest depths to the gentle humor of “Let’s Put the Dirty Back in Dancin'”. The title song details a mystery that took place in the Mexican desert many years previous and is kept hidden in the past with oblique references. This cd, her 5th, is a must have for Bianca fans.